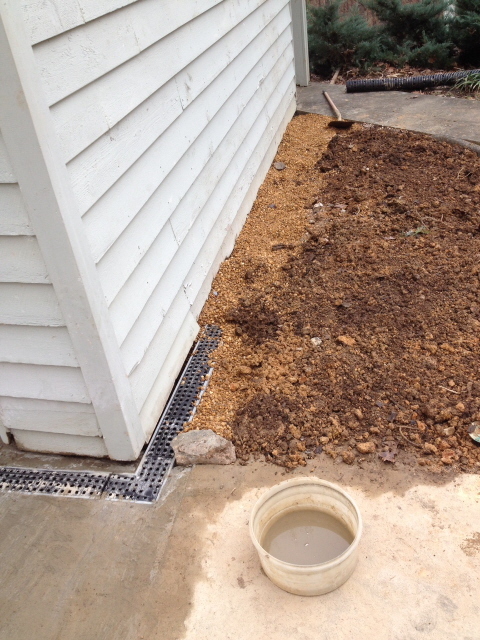 Repairing a Drainage Problem – Johntheplantman's stories, musings, and gardening. Repairing poorly installed drainage can be a lot of work but it can also be a bit of a fun job. We must be flexible, also. For instance, I had to change my approach in the middle of this job. The problem I needed to tackle was that runoff was flowing through a carport that had not been designed for handling heavy rain. The carport had apparently been added on after the original driveway was built. Water flowed across the driveway, around a front corner of the carport and down the inside edge. We studied the area and found that a low place in the concrete allowed this to happen. 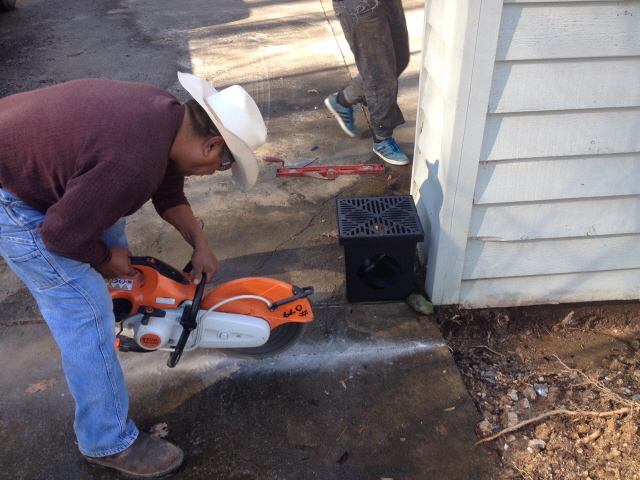 I originally thought we would need a concrete saw and a catch basin. 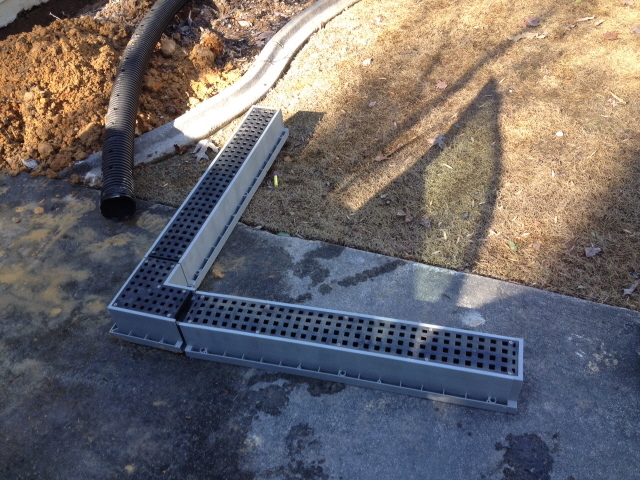 So, I bought a catch basin (that’s that black box in the picture below) and rented a concrete saw. I learned long ago that an expensive part of the job is that you can rent the machine but you have to purchase the blade. Concrete blades do not have a very long life expectancy. It’s a slow and careful job to cut concrete but sometimes you just gotta do it. There was a crack in the existing concrete right at the low spot. We decided that we needed to take out the entire portion in order to make the finished job as it should be. Anyway, we cut the concrete. It was a nice job. We had to cut it into three pieces to remove the offending concrete. It was rather heavy. 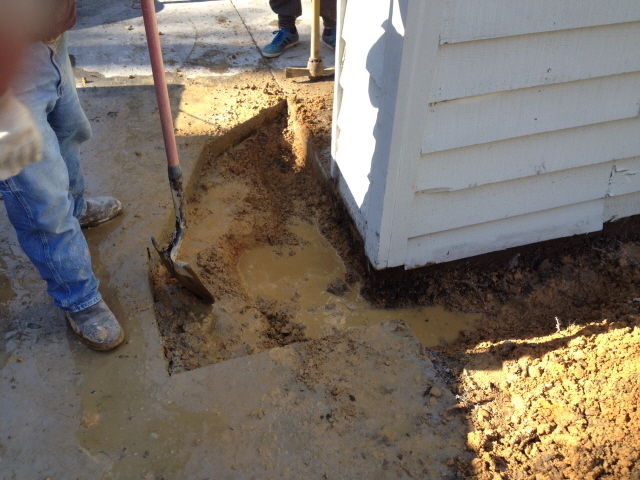 Whoever had poured the concrete for the walk to the back door had fortunately put a four inch pipe under it. I was going to take the water to that pipe and channel it down the hill. That’s when I discovered that the water outlet on the catch basin would be too low to allow me to hook up to the pipe under the walkway. An old man told me one time, “Here in Georgia the water always runs downhill.” I have always remembered that. So, I had to go find some other way to channel the water downhill. I really liked the way things turned out. Below is the drain system. I found that I could purchase just the components I needed at my concrete supply place. We lay the drain in just the right place and, before pouring the concrete around the basin, fooled around with a couple of levels, making sure that the water would run into the drainage and not go around it. It pays to be careful when setting something in concrete. 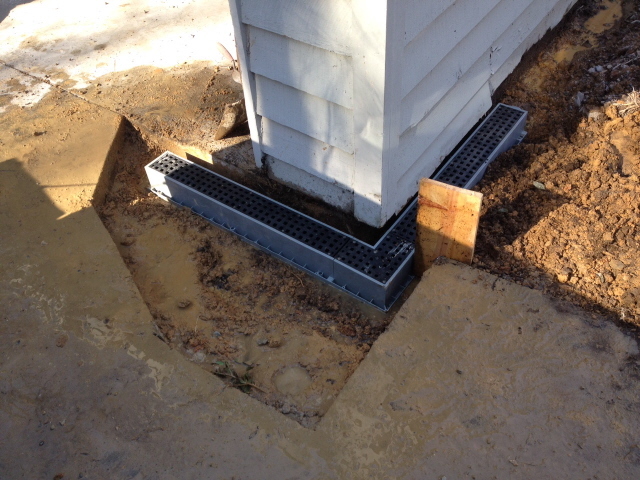 When fitting drainage boxes to be poured in concrete, use the level over and over just to be sure. The drain was fitted with a special piece that was designed to fit corrugated black pipe. There are two kinds of corrugated black pipe: “solid” and “perforated.” The solid pipe is used to move water from one place to the other and the perforated pipe is used to pick up and re-distribute ground water. Two things to remember when installing this pipe are: 1. The stripe goes up and, 2. The holes go down. 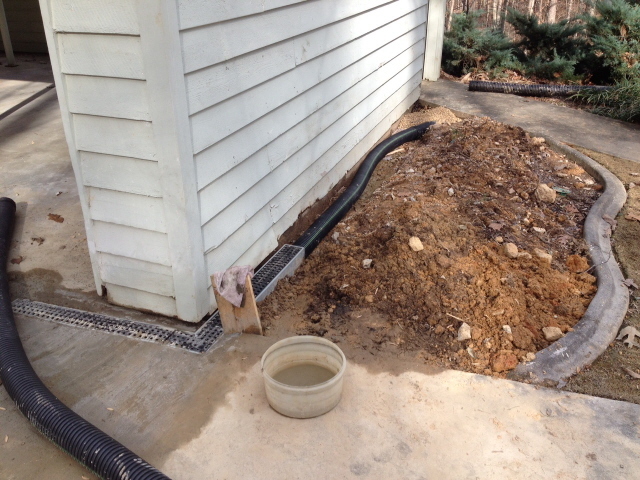 In the picture below I have used the solid pipe to move the water to the back corner of the walkway. I then put in an eighteen inch piece of perforated pipe to pick up any moisture from the shrub bed itself. This is placed in a bed of gravel. We filled around the pipe with pea gravel and raked the soil out to shape the planting bed. The gravel will keep the dirt from coming in contact with the siding on the building. Notice the rock at the corner where the driveway meets the drain. That rock has been carefully chosen and carefully placed to enhance the water flow. 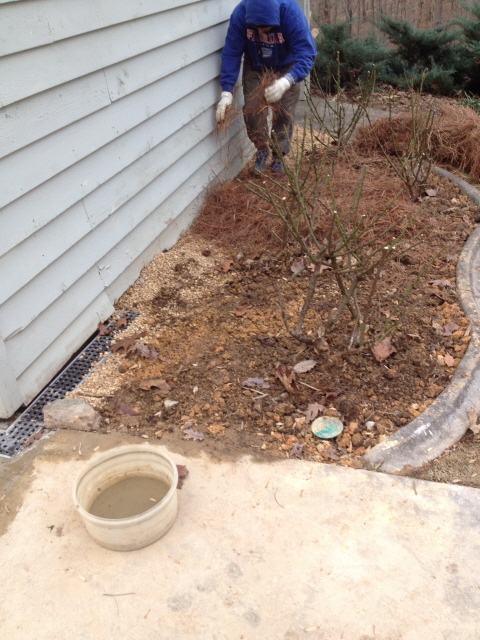 The next job was to replant the roses, clean the bed well, smooth out the pea gravel, and spread pine straw. It was extremely cold at this point and I didn’t get a finished picture. 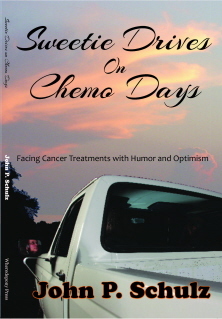 Perhaps I’ll sneak one in here at a later date. smoothing, planting, and mulching the improved shrub bed.